I don’t have to look at old photographs of the Valley to see pictures of a past and a place much different than today. I need only to close my 54-year-old dream screens and conjure up scenes from my early childhood through my twenties . Most everything has changed like, for example, the simple routine gas stop. My memory goes back to the days when parents could drive along with windows up, smoking a cigarette as their children sat unrestrained by seatbelts just inches away. No one thought anything about it. One long-gone ritual from those less enlightened days was stopping for gas at one of the many neighborhood full-service gas stations. My folks mostly went to the white and red cinder block Phillips 66 station on South Pines road where Polka Dot Pottery is now. Like most stations back then, there was a small counter area with just a limited offering besides fuses, fan belts and roadmaps, like a small variety of the top-selling candy bars and gum and some pop. Two service bays took up about two-thirds of the building’s north end. You had to go around the corner to get to the small, drab bathrooms on the south outside wall. The “service” in service station was all about servicing the car, not spoiling patrons with spacious tastefully designed, well-lit bathrooms. While I don’t recall the name of the owner, I do remember he seemed a bit debonair with his white hair neatly combed and oiled. Below his nose was an equally well-groomed white mustache with its opposing ends extending an inch off his face and curling up to sharp and rigid points. It is no wonder his face is entrenched in the caverns of my memory considering how often he loomed above outside the car doing his job . In good weather he was jovial and the chat was always friendly. In bad weather we saw more of his employees which was good because it was often too miserable outside to roll down the windows and visit . I was always mesmerized watching them looking through the windows at us but not seeing us and then squirting cleaner on the film of dirt and bugs I hadn’t even noticed before. Then they wiped it clean with their squeaky squeagies and often went on to pop the hood to draw forth the mystical dipstick. It was a Mayberry part of life in Opportunity that was on its way out with the 1960’s. Somewhere during the changing of the eras, the “Self Serve” pumps showed up in the far lane at the small gas stations dotting the Valley like the freckles that ran amuck across my face when I was a kid. For awhile they offered both full and self-service, but people frugally and routinely chose braving the elements to pump for themselves and pay a little less . Slowly and sadly, the Goobers and Gomers of the gas stations came out less and less, and then one day, like little Jackie Paper, they came no more. We have been living in the era of the convenience store ever since. To put it mildly, it is a stale industry that has not evolved much since 7-11 stores pioneered the Valley, though it is a bellwether to the overall unhealthiness of our society. Today’s purveyor’s of gasolene are more filling stations now than ever. It is unbelievable the amount and variety of liquid beverages we are offered now as compared to the early days. Since I hated pop as a kid, I was keenly aware that there were no bottled or canned non-carbonated drinks. Finally, Country Time Lemonade came out in a can and that was the best it ever got during my youth. Then Snapple was introduced and mass-marketed while Gatorade morphed from a one-trick pony into the mother of all sports drinks. We must be very, very thirsty if we can support all these people and products in the beverage industry. But overall, beyond the occasional teaming up with a Subway or Wendy’s, the convenience stores of today are close to what they were in the beginning. I actually had not noticed or ever thought about it until we stumbled upon the open house party last Wednesday at the new super-convenience store at Evergreen and Broadway, Maverik, The Great Adventure. We were headed back from the food court at the mall where we had met our daughter for dinner. Talk about bad timing. There I was with a $5 Bruchi’s Philly Steak sandwich hogging up all the room in my tummy as I milled about all the free food a free-loader like myself could ever want at the Maverik’s crowded, live-remote open house. Like it or not, my full tummy had to stretch more than it wanted as I forced it to accommodate a few desert items like a bite of cookie or two, a dab of frozen yogurt or two and serving or two of jerky. They did not need to give me free food to win me over, though as always I did appreciate it. This new store is something like their 240th store in the western US but it is the Valley’s first and I see nothing around here to stop them from slamming in as many as they want. Certainly the present competition is little deterrent. The word competition is being generous to the local convenience stores because Maverik is on a different playing field. They have actually thought of the best way of doing things and then implemented those thoughts. For example, as a coffee drinker I spend so long looking for the coffee cup lids at unfamiliar stops that my coffee is nearly cold by the time I find them hidden in some illogical location. Then I normally have to set down my cup and focus carefully using both hands to get one lid away from the interlocked stack of lids. At Maverik there is this ingenious container right where one would think lids should be that you pull and one lid at a time handily pops up. Another simple well thought-out solution to a widespread problem is a contraption attached to the bottom of the bathroom doors called Clean Escape. While Americans may be drinking themselves to unhealth without a care, many can’t stand the thought of grabbing the bathroom door handle with unprotected hands to get out. 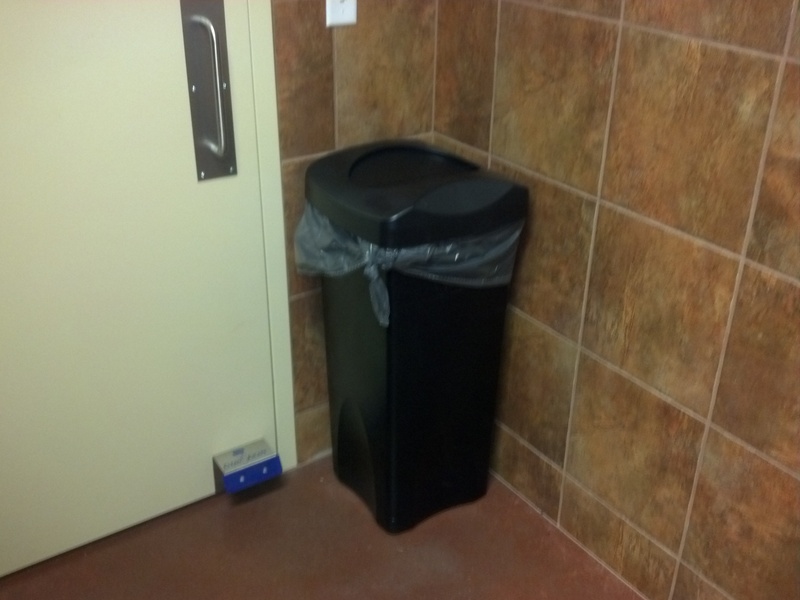 In addition to the wisely placed garbage can next to the door to receive paper towels the hand-washers use to grab the handle to protect themselves from the none-washers, Maverik has provided the Clean Escape gizmo that allows the strong of foot to pull open the door using a toe or two. Then there is the social media they have mastered on the internet including Facebook,Twitter and Youtube. Suffice it to say that I am already a club card-carrying member and able to track every penny that I spend there wisely and otherwisely. And just like the old days of S & H greenstamps, I am building points that I can also keep tabs on as they amount to not anything great but far greater than anyone else is giving me. I could go on drawing a picture of this incredible new place, where attendants are called “adventure guides” and chefs bake fresh bread daily but it is a welcome and fresh scene you can see for yourself. But take it in soon and remember it carefully, because someday convenience stores like gas stattions , will become memories from the past. 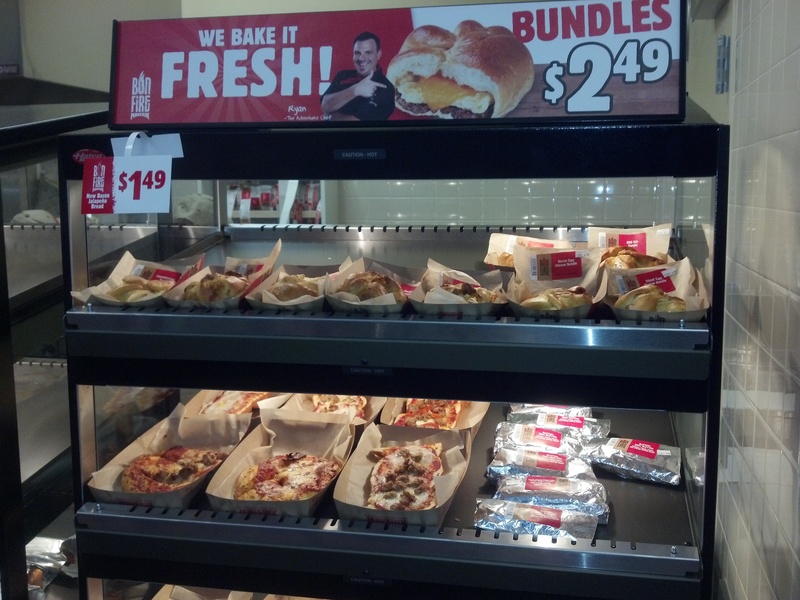 Forever have the 3 Valley 7-11 stores stood head and shoulders above the competition in the arena of really fast food. Maverik’s arrival gives them a rival that has raised the maple bar. Literally, they make their own and add bacon on top. 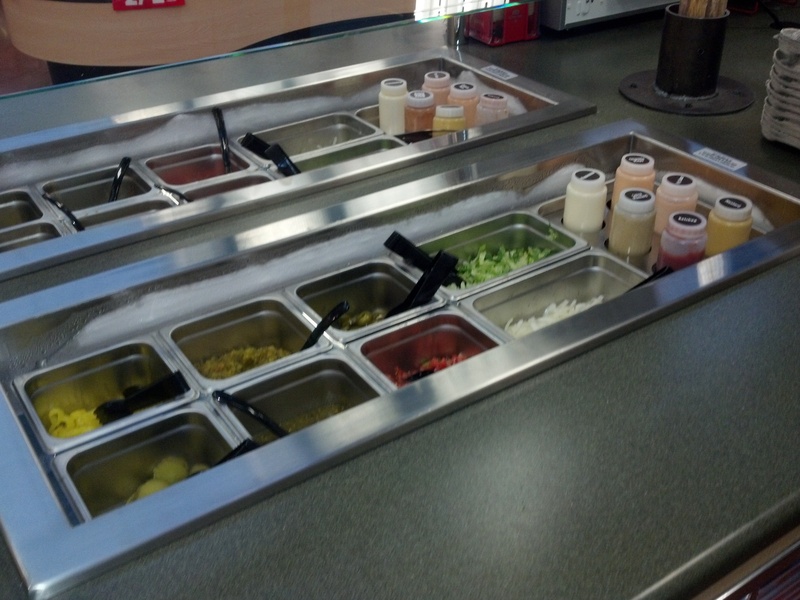 They have also raised the condiment bar. While you can grab the packets of mayo ketchup and such if you are in a super hurry, you can also take your time and load up the old dog with every kind of topping imaginable. 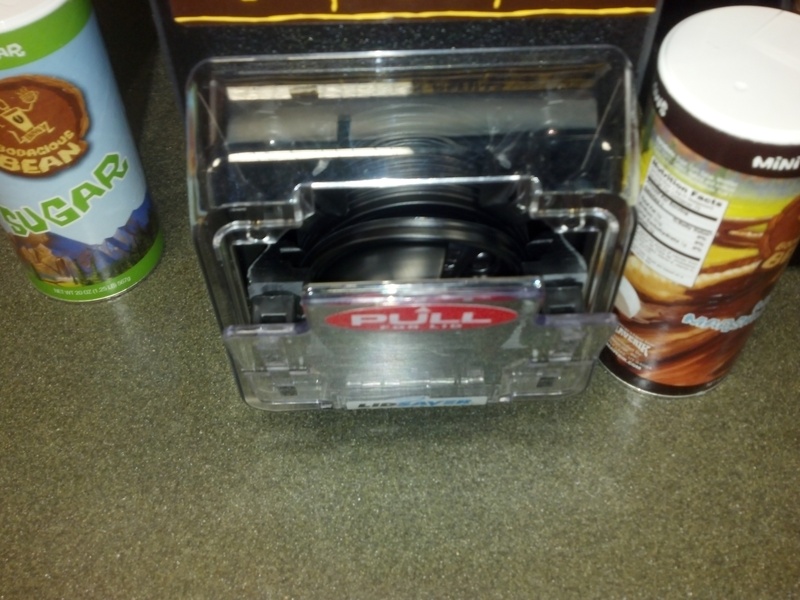 This the incredible, ingenious and indespensible dispenser of cup lids that indicates the impending impact Maverik is about to inconvenience the local convenience store competition with. They just have it figured out, right down to getting out of the bathroom. Everyone is talking about The Roadhouse, the new Country rock nightclub that is getting set to open. A good friend of mine, Jim Kuhlman, is setting up the cameras and tv’s and computors and sound and lights. He was our guy for all that stuff at the Rock Inn and now he’s Fred Lopez’s guy at the Roadhouse. I put them together and so that gives me a front row seat to what’s going on with the place. On top of that connection, I am fairly good friends with Fred and helped in the early stages with design. The bar is my biggest contribution. Not that I designed it, but rather that I convinced him that the old bar had to go and he needed to do something very close to what he created at his other new place, The Ref. 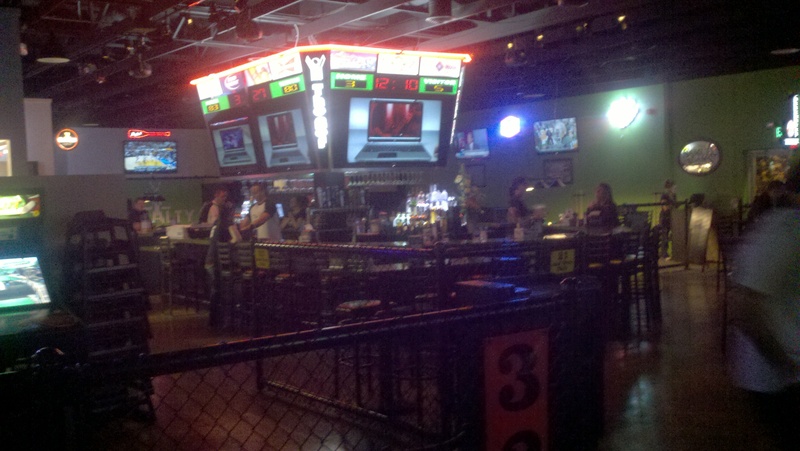 The Ref’s bar is the only bar that you routinely see couples and women sitting at. It is huge and oval with a large bank of flat screens hung overhead in the middle. It is one of the best bars I have ever seen and I lobbied hard for Fred to recreate whatever version of it he thought would work at this new place. Once he agreed, all I did was draw up his idea and then he hired the same guy who built the Ref’s. 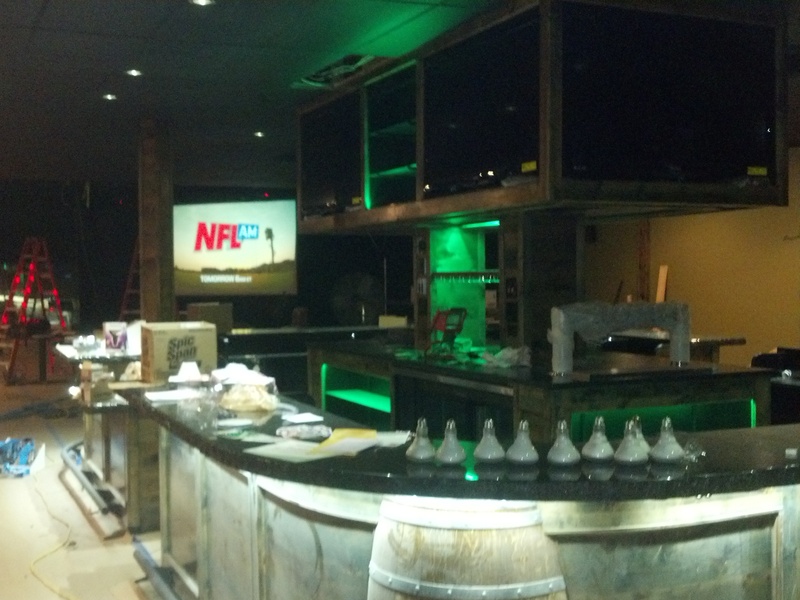 It turned out beautiful as the picture below shows even in the middle of the construction scene before it is all shined up and stocked with glistening glasses and beautiful bottles of booze lit up with accent lighting as the plasmas play patiently in the middle above it all. While that picture is still just in my head, I got the one below Thursday when I went down and saw Jim as he was getting ready to start his lonely nightshift working on fine-tuning his many projects. This visit prepared me well for all the people we ran into yesterday as Elaine and I went out for an early dinner and then stopped at a few places to visit with friends. I never one time brought up the Roadhouse, but I was amazed at how often it came up. We started out up at Hogan’s on the Southhill. We had been meaning to eat there for nearly a month since Elaine had waited on the owners where she works at Ferraro’s on Division. They told her she was a fantastic waitress and asked her to come check out their place. What a pleasant surprise. It is right next to Trader Joe’s which had Granola Cruisers and Vegan Heads streaming in and out the whole time I was eating my unhealthy but exquisite pulled pork sandwich and sweet potatoe fries. Elaine’s wrap was much healthier but still tasted quite good. Elaine, of course, gets into a conversation with Jen our waitress and asks her how she likes working at Hogans. Jen says it is great but she had just put in her two-week notice because she had been hired last week to be a bartender by Alison who works for Fred at the Ref and will be managing The Roadhouse. Elaine told her we knew Alison and her boss. Jen was very excited about her new job and told us to be sure to come see her. Elaine assured her that we would. Then we stopped in at Mike’s Tavern, which was amazingly busy for 5:30 on a Saturday, to see Danette who had moved there from Sullivan Scoreboard a few months back. Our friend Jim had seen her at The Roadhouse recently and so Elaine was curious to find out if Danette had applied there. Turns out Danette had been having lunch at The Monkey Bar with Dianne Record, who owns Sullivan Scoreboard, and curiosity got the best of them so they wandered over to have a look around. She was flabbergasted at how great everything looked and commented that there was nothing like it in Valley, I told her there was nothing like it between Seattle and Chicago. If we are at a place and it is busy in the Valley, Elaine will get into at least a half dozen conversations with old friends, give out a handful of warm hugs to people she is glad to run into and pass out friendly hellos to at least a dozen faint aquaintences. She is a friendly thing. During the course of her visitations, The Roadhouse kept popping up and I showed off the bar picture on my Droid more than a few times. On our way home we noticed that Darcy’s had a lot of people and so we stopped. Turned out that there were three different parties going on and the places was hopping and so too was Elaine shortly after arrival. Hopping about hugging and hello-ing like a talkative version of the energy bunny on laughing gas. Pretty soon I am pulling up the bar picture and showing people how cool the place that they keep talking about is going to be. I also used my Droid to text Fred to see if he and Melanie were doing anything. It was 7:30 and he texted back that he been working at the Roadhouse since 6 in the morning and had just gotten home. I thought my day sounded much funner talking to everyone about The Roadhouse rather than working on it. When we drove past it on our way home I noticed Jim’s truck in the parking lot. I guessed that he must have punched in about the time Fred was clocking out. They better not be slacking because the place is suppose to open November 14th and everyone wants to see it and I can only show a limitted number the preview on my Droid. Here is the bar Fred dreamed up for The Ref. As far as bar styles go this is a grand slam home run slash Hail Mary touchdown slash half court swish. This the my 3-D rendering of his new version The Roadhouse. This is the Roadhouse bar just waiting for the action to get started. Notice the 160-inch high def projection screen in the background. Adjusting and dialing it in was one of Jim’s projects for Thursday night.